A Production Expertise Skill for changing demons into crystals and for fusing equipment. [Note] This Expertise is affected by accordance to your Intelligence and Luck attributes. Requirements to unlock: Occultism at Class 1-0. Gains expertise equal to 40% of your Occultism level. Gains expertise equal to 40% of your Demonology level. Gains expertise equal to 10% of your Weapon Knowledge level. Gains expertise equal to 10% of your Mineralogy level. A secret art that fuses the power contained within Demon Crystals and Tarot Cards with equipment. When successful, the crystal or card is lost, but the equipment acquires special powers. When unsuccessful, the equipment's Durability decreases. Cannot be perform on items with 0 Durability or items currently being equipped. Luck adds a 1% bonus per 5 points. A secret art that fuses summoned demons with certain jewels to create Demon Crystals. When successful, the demon is lost, but a Demon Crystal is acquired in its stead. When unsuccessful, the jewel is lost and Friendship level with the demon drops. Cannot be performed if friendship with demon is low. [Note] Demons with Friendship Level lower than "Open Hearts" cannot be used for Demon Crystallization. [Note] Demons that has been re-birthed cannot be used for Demon Crystallization. Intelligence adds a 1% bonus per 10 points. Luck adds a 1% bonus per 10 points. With this secret art, you can fuse Demon Crystals and Soul Stones together with Equipment. When successful, both the crystal and stone is lost but a special power is added to the Equipment. When unsuccessful, the Equipment's durability is decreased and both the crystal and stone is lost. Cannot be perform on items with 0 Durability. Intelligence adds a 1% bonus per 5 points. By the art of Occult Fusion of Tarot Fusion and Soul Stone Fusions, certain equipments can be transmute into an entirely different item. Soul Stone a Demon Crystal to the desired initial item. Tarot Fusion the second object onto the same item. When Tarot Fusion, the transmuted item will appear, click on the new item otherwise you will have an item with the power of those two used crystal. See Here. [Tip] The Sorrowful weapons, you can have a higher success percent when Tarot Fusion first and next Soul Stone Fusion. 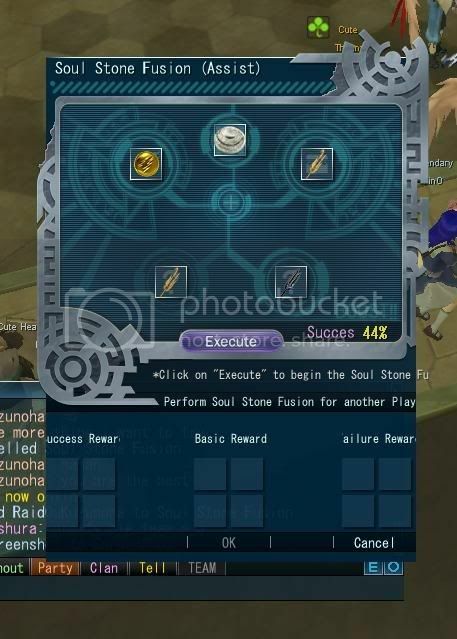 [Note] When upgrading a weapon involving a Crystal of Sublimation, Soul Stone the Relic Piece first, and next Tarot Fusion the Crystal of Sublimation. Soul Stone a Demon Crystal to the desired item. [Note] When upgrading an equipment involving a Crystal of Sublimation, Soul Stone the Crystal of Sublimation first, and next Tarot Fusion the second item. Soul Stone an Elementine to the desired Machete. Tarot Fusion a Crystal of Sublimation onto the same Machete. This page was last modified on 20 October 2015, at 09:21.